1. Bring the palm sugar and 4 tbsp water to the boil in a small saucepan, stirring often to help dissolve the sugar. Boil for 10 seconds, then remove from the heat and set aside until nearly cold. 2. Peel and finely chop the kiwis. Add the cooled sugar syrup and lime juice. Pour into a small, shallow freezerproof dish and freeze for 6 hours or overnight. 3. To serve, use a fork to scrape the top of the granita mixture to form small ice crystals. If this starts to melt, transfer to a container and freeze, while continuing to scrape the rest. 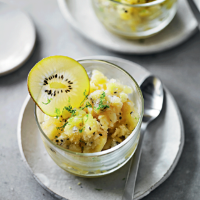 Serve piled into bowls or glasses decorated with lime zest and kiwi – eat immediately.